According to new reports, Huawei has sourced AMOLED panels from Samsung for the Mate 20. Of more surprise is the fact that these panels are apparently 6.9-inch ones, which likely means a size hike for the next Huawei flagship, bringing it eerily close to tablet territory. 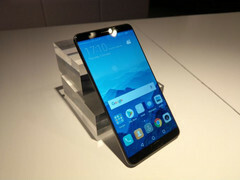 Huawei released the Huawei Mate 10 devices towards the end of 2017. We’re already close to the mid-way mark of the year, though, which means it’s about time we started getting word of the next Huawei Mate flagship. The device is expected to be named the Mate 20, instead of the Mate 11 as logic would normally dictate. We saw the same thing with the Huawei P20 devices, so it isn’t exactly novel. What’s more surprising, however, are the reports that the device will feature a 6.9-inch display. According to the source, Huawei has placed orders for 6.9-inch AMOLED displays, and from Samsung to boot. The Huawei Mate 10 Pro sported a 6-inch display, so this would be quite the jump in size. The Mate devices are positioned as Huawei’s marquee devices with big displays, and reports claim that the hike in size is supposed to allow the Mate 20 compete against the Samsung Galaxy Note 9. The whole thing also begs the question of what resolution this display will be. At 6.9-inches, it’s unlikely that Huawei opts for a FHD+ panel on its top of the line offering. As such, there’s a high chance it’s a QHD panel, although Samsung hasn’t been generous with selling those to third parties in the recent past.